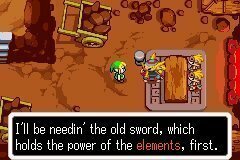 Wait, this is the swordplay class, right? 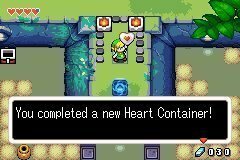 The between-dungeon item-collecting expedition continues, as I start looking for Heart Pieces. There are now heart pieces in dungeons, which I don't think any Zelda game has done before this. 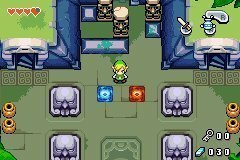 When revisiting a dungeon, in addition to the standard red warp tile that takes you to a miniboss room, you now have blue warp tiles that take you to the "heart room". Like this. 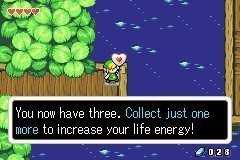 Completing a heart means a lot at this early stage; it's a 25% health increase. Here's the first of the Bottles in the game. 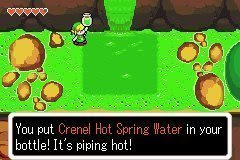 Bottles have been crucial in Zelda for a long time. 20 Rupees is a total steal for this, too. 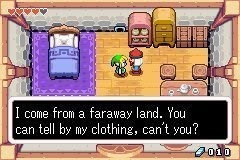 Link stumbles upon a guy with a turban. He then builds a wall around the guy's house, at least until we figure out what's going on. You haven't seen all of the billboards in the South yet. 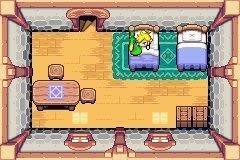 Link goes home and sleeps...with the Minish Cap! YOU JUST MET! HAVE YOU NO SCRUPLES? MY GOD! HOW MANY POSITIONS DID YOU DO IT IN? 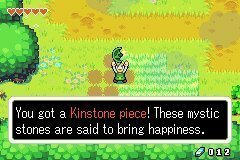 Our hero rummages around in the grass until he finds something that "brings happiness". I'm not even gonna say it. 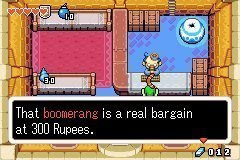 After the uber-bargain Bottle we got a little while ago, this Boomerang isn't a deal at all. 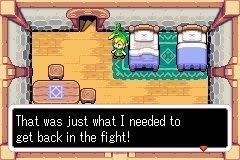 It's basically the starting Boomerang from A Link To The Past. Time to head up to the mountains. Things look a bit more gravelly up here. These rocks are very lollipop-like. Not to be confused with Ann from Persona 5, who is essentially a human lollipop. Speaking of human lollipops, Link. Chug! Chug! Chug! 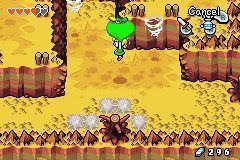 The Minish Cap can double as a glider, as seen here. 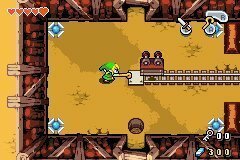 It lets Link glide over lava and pits, not unlike the rooster in Link's Awakening. 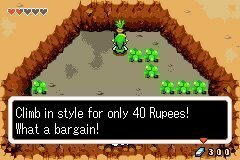 Another useful Deku Scrub...this one sells a climbing implement. 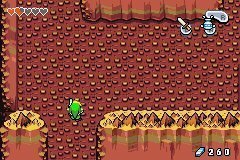 With said climbing implement, Link can scale cliffs. 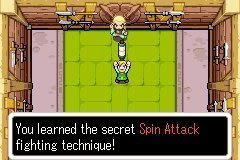 I remember doing this in the N64 Zeldas, too. Atop the cliffs, it's pouring. 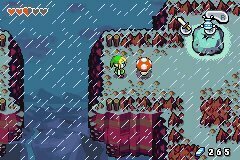 It's funny, when I was a kid I used to think it'd be really cool if Death Mountain (in A Link to the Past) had a thunderstorm going on. 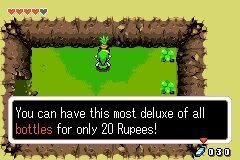 I'm sure there's a way to hack the game to do that. Speaking of A Link to the Past...I'll cover that too at some point. 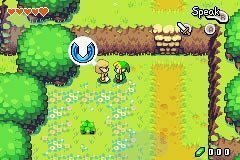 It's sorta the only retro 2D Zelda left. 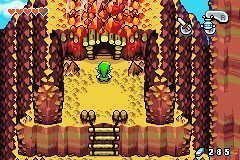 Fun Fact: This area actually DOES play the storm theme from the beginning of A Link to the Past. 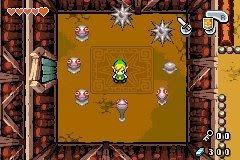 Mid-2000s Zelda games tended to reuse that theme quite a bit, which was a good call. But wait! 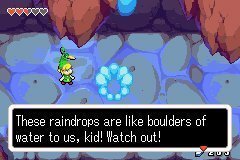 When in Minish size, suddenly rainstorms go from awesome to deadly. Our hero is confronted by a seedy gnome. 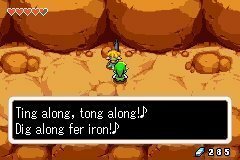 When he said "ting", I immediately thought of Tingle. When I played Four Swords Adventures, Tingle would show up every time a large force gem dropped. 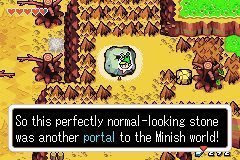 The screen would pan out a bit, then he'd appear with this creepy "WAOW" sound and hover towards the gem. If I didn't pick it up in time, he'd make off with it like a damn force gem leech. That "WAOW" still haunts my nightmares. At this point the Smithy gets to work on repairing the sword I got at the beginning. 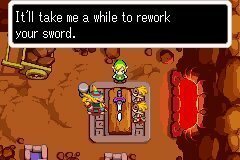 Soon it'll be the Master Sword, but first I have to find a bunch of ingredients. No word on if it'll follow the Final Fantasy XIII model of requiring Strange Goo and Imp Pee to upgrade a stronger weapon. Watts is all about the info. 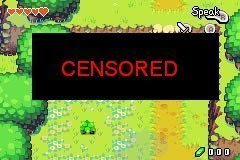 ...Secret of Mana, that's another one I need to cover. 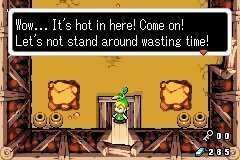 That's helpful, and it's where we need to go next. 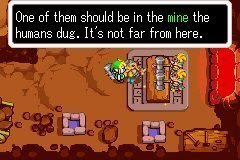 The next dungeon is found soon afterwards. This one is the element of fire. In other words, it's continuing to follow the Final Fantasy 1 order. I need to cover that one too. 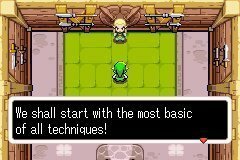 "Oh Link, you're such a BEAST!" 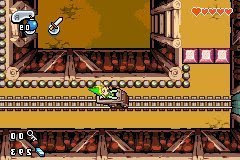 After that, it's back to the dungeon for the Ultimate Thrill Ride, as our hero takes off on a mine cart...that's heading straight for a wall! THERE'S NO TIME TO BRAKE! 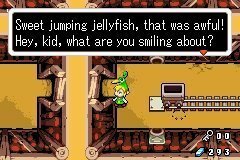 Link is smiling because of the severe concussion. 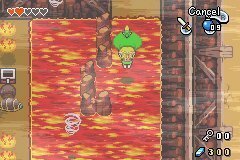 Things go from bad to worse, as the mines give way to molten lava. 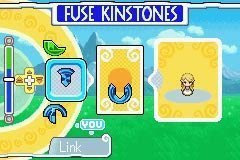 Treasure Chest: "Oh Link! You're such a BEAST!" 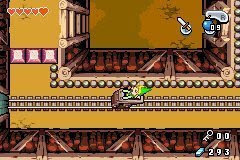 Link now takes off on a mine cart in the other direction as his descent into madness continues. 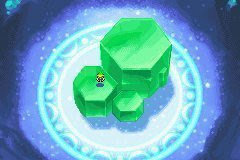 A room-full of slimes is the next challenge. 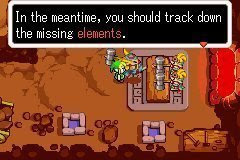 If this were Chrono Trigger (another game I have to cover), Crono would clean up with Cyclone. 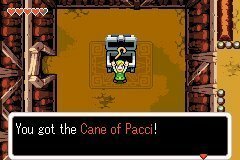 The Cane of 2-Pac is our next major item. This one flips things over. That cane must be useful in bed. Being able to flip someone like this would no doubt elicit a "Oh Link, you're such a BEAST!" 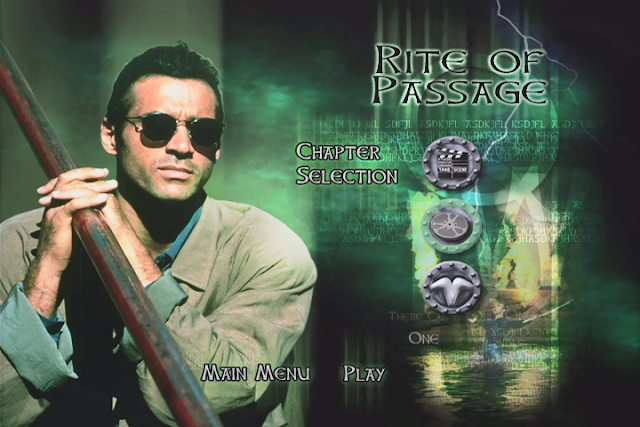 More on this fantastic game shortly.